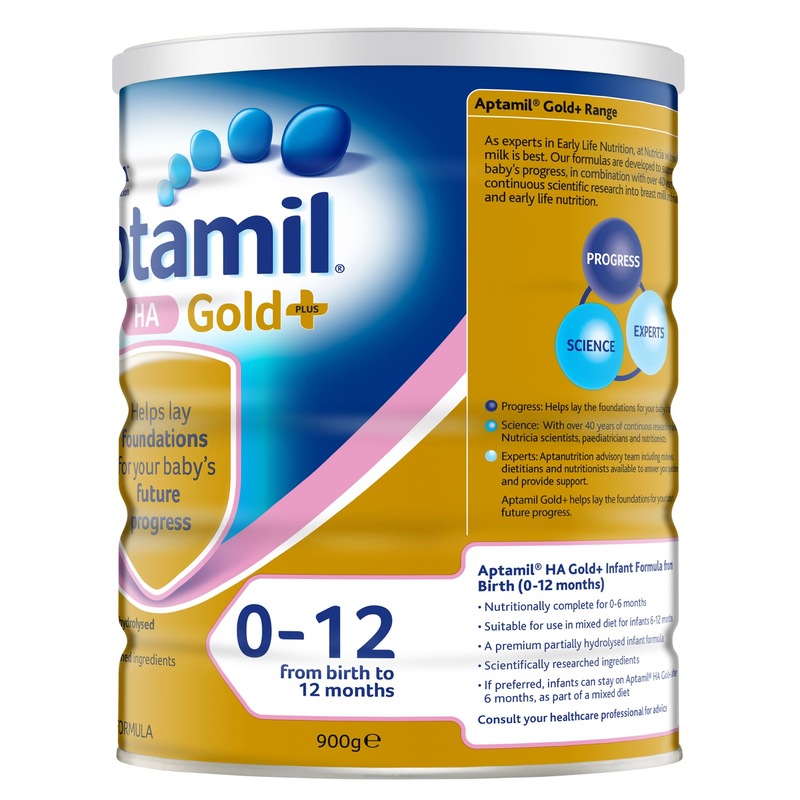 Aptamil® Gold+ HA is a premium infant formula for babies from birth to 12 months of age. It is designed for babies at risk of allergy and is suitable for babies with a family history of allergy. It contains specially treated protein (partially broken down (hydrolysed)) to make it gentle on the digestive and immune systems. Aptamil Gold+ HA is not suitable for general use and should be used under medical supervision. It is not to be used for infants with a diagnosed cows' milk protein allergy. Not to be used for infants with a diagnosed cows' milk protein allergy. Breast milk is best for babies. Before you decide to use this product, consult your doctor or health worker for advice. Consult your healthcare professional for advice. If correctly sotred & made up in accordance with the directions contained on the label, no further vitamin or mineral preparations are necessary. Aptamil HA Gold+ is based on partially hydrolysed cows' milk proteins. Milk Solids, Vegetable Oils, Galacto-oligosaccharides (Contains Milk), Emulsifier (Citric Acid Esters Of Mono- And Diglyceride, Soy Lecithin), Long Chain Polyfructose, Dried Omega LCPUFAs (Contains Fish, Antioxidant (Ascorbyl Palmitate, Tocopherols)), Choline Chloride, Taurine, Inositol, L-carnitine. Vitamins: Vitamins (A, B1, B2, B3, B5, B6, C, D3, E, K1), Biotin, Folic Acid. Mineral: Potassium, Phosphorus, Calcium, Chloride, Iron, Zinc, Copper, Manganese, Iodine, Selenium. Nucleotides: Uridine 5'- Monophosphate, Cytidine 5'-Monophosphate, Adenosine 5'- Monophosphate, Inosine 5'-Monophosphate, Guanosine 5'- Monophosphate. 1 scoop = 4.6g of powder. Note: 1 scoop of powder added to 30mL of water yields approximately 33.3mL of formula. This feeding guide is a general guide only; your baby may need more or less than shown. 4. Always add one level scoop of powder for each 30mL of water. Stir or shake briskly to dissolve the powder. 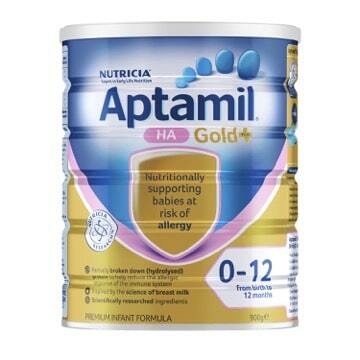 Aptamil Gold+ HA Infant Formula From Birth 0-12 Months 900g is rated 5.0 out of 5 by 10. Rated 5 out of 5 by Mel K from Easy to use great on the tummy Been using Aptamil Gold since my sone was 3months old and he loves it never had any issues. Rated 5 out of 5 by Shadow LI from GOOD I bought Aptamil Gold HA first time. It is great for my baby. I will keep buying this HA formula.